It’s a fact: Many student organization meetings are lame. While there are many reasons for this disappointment, the biggest is usually quite simple: There was no need for the meeting in the first place. 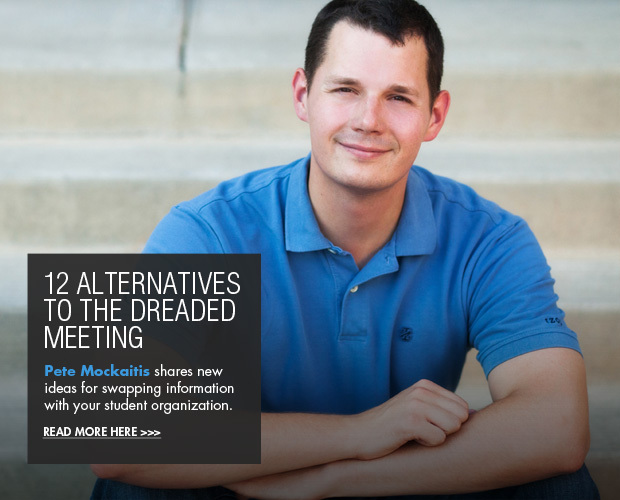 Meetings are best for tackling objectives that require real-time, two-way conversation. Form a private Facebook group and have everyone share their input on the question at hand there, so all can see and respond to one another. Put a flipchart in your organization’s office space with sticky notes. Ask each member to leave their favorite idea on the topic by a certain time. Make a quick YouTube video presenting the key announcements in a goofy, fun way. Email your announcements, but bury a specific request like “reply to this email saying ‘I read this’ to be counted as attended at this ‘meeting’” in the middle of the note to track actual readership. Create a page on speakpipe.com and encourage folks to provide their input via a voicemail to you there. Collect your executive board and resolve quick questions real-time using group texting via groupme.com. Record your regular announcements audio-style and upload them to soundcloud.com, then point folks to the link. Collect input from your members via online surveys such as Google Forms, wufoo.com, or surveymonkey.com. Collaborate remotely with two computers via join.me or Skype screen sharing. Collectively revise the document in question at your everyone’s own pace via Google Docs. Set up a mini-chat with just the key players in advance via freeconferencecall.com or a Google Hang Out. And for good low-tech measure…send out extra special event announcements via an old-school, mailed paper invitation. It stands out because nobody does it. Learn more about Pete Mockaitis and his student leadership keynotes at campuspeak.com/mockaitis.